Raz Kids - Welcome to 2B! To access Mrs. Bourdon’s group, click on icon below...if it does not read: Class Chart for Joyce Bourdon, click This Is Not My Class and type in jbourdon1. Then find your name and click on it to enter the level of reading that your teacher has selected for you. Be sure to listen to a story, read the story for yourself, and then take the comprehension quiz. Remember to always do your best work! To access Mrs. Stupalski’s group, click on icon above...if it does not read: Class Chart for Dana Stupalski, click This Is Not My Class and type in dstupalskia. 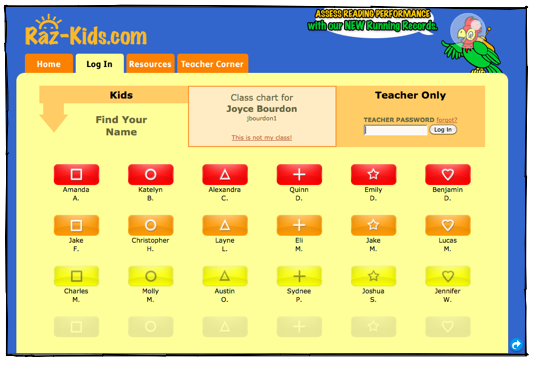 Then find your name and click on it to enter the level of reading that your teacher has selected for you. Be sure to listen to a story, read the story for yourself, and then take the comprehension quiz. Remember to always do your best work! To access Mrs. Johnson’s group, click on icon above...if it does not read: Class Chart for Teah Johnson, click This Is Not My Class and type in tjohnsonaaas. Then find your name and click on it to enter the book room. The book room is wide open now to enable you to explore all the possibilities and levels. Be sure to find a book that is just right for you! To access Mrs. Sollauer’s group, click on icon above. If it does not read: Class Chart for Teah Johnson, click This Is Not My Class and type in tjohnsonaaas or Mrs. Stupalski's group click on This Is Not My Class then type in dstupalskia. Then find your name and click on it to enter the book room. The book room is wide open now to enable you to explore all the possibilities and levels. Be sure to find a book that is just right for you!